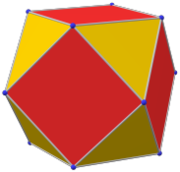 In geometry, a pentagonal hexecontahedron is a Catalan solid, dual of the snub dodecahedron. It has two distinct forms, which are mirror images (or "enantiomorphs") of each other. 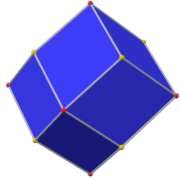 It has 92 vertices that span 60 pentagonal faces. It is the Catalan solid with the most vertices. 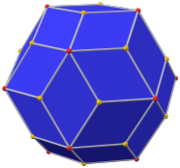 Among the Catalan and Archimedean solids, it has the second largest number of vertices, after the truncated icosidodecahedron, which has 120 vertices. The pentagonal hexecontahedron can be constructed from a snub dodecahedron without taking the dual. Pentagonal pyramids are added to the 12 pentagonal faces of the snub dodecahedron, and triangular pyramids are added to the 20 triangular faces that do not share an edge with a pentagon. The pyramid heights are adjusted to make them coplanar with the other 60 triangular faces of the snub dodecahedron. The result is the pentagonal hexecontahedron. The faces are irregular pentagons with two long edges and three short edges. The ratio of edge lengths is about 1:1.7498525667362. The faces have four obtuse angles of about 118.13662 degrees each, and one acute angle (between the two long edges) of about 67.45351 degrees. The dihedral angle is about 153.178732558 degrees between all faces. Note that the face centers of the snub dodecahedron cannot serve directly as vertices of the pentagonal hexecontahedron: the four triangle centers lie in one plane but the pentagon center does not; it needs to be radially pushed out to make it coplanar with the triangle centers. 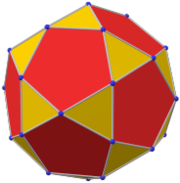 Consequently, the vertices of the pentagonal hexecontahedron do not all lie on the same sphere and by definition it is not a zonohedron. Isohedral variations can be constructed with pentagonal faces with 3 edge lengths. This variation shown can be constructed by adding pyramids to 12 pentagonal faces and 20 triangular faces of a snub dodecahedron such that the new triangular faces are coparallel to other triangles and can be merged into the pentagon faces. The pentagonal hexecontahedron has three symmetry positions, two on vertices, and one mid-edge. Eric W. Weisstein, Pentagonal hexecontahedron (Catalan solid) at MathWorld. This page was last edited on 22 September 2018, at 06:13 (UTC).